that enable joint hardware-software optimization for taming the transceiver complexity of the high-dimensional MIMO systems at such high frequencies. A key characteristic of cm-wave and mm-wave propagation channels that facilitates complexity reduction is their expected sparsity in beamspace. The hybrid analog-digital CAP-MIMO architecture enables optimal and efficient access to the low-dimensional communication subspace induced by the sparse MIMO channel. 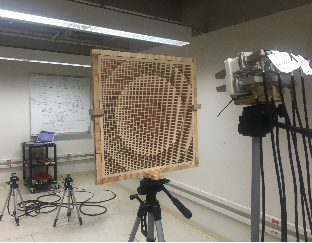 Fig 1: CAP-MIMO Transceiver: The front-end lens antenna is excited by the beamspace feed antenna array spanning the coverage area. p precoded data streams are mapped to O(p) beams via the mmW beam selector. The selected beams span the sparse communication subspace of the high (n) dimensional channel. 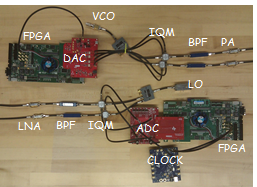 Project Scope and Prototyping: The project involves the development of basic theory, communication and signal processing algorithms, computational modeling and simulation, and prototype development. 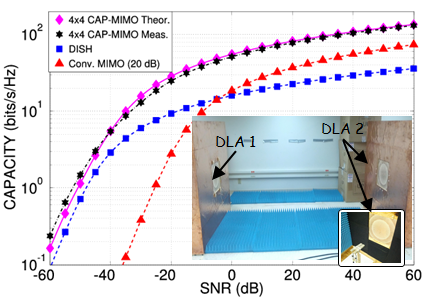 We have recently achieved initial proof-of-concept demonstration of CAP-MIMO with a 10GHz prototype that can support four spatial channels in a point-to-point (P2P) link for achieving 1Gbps data rate. We have recently developed a second generation (Gen 2) prototype at 28GHz and achieved a major milestone of real-time demonstration of MBDM capability in a point-to-multipoint (P2MP) setting. We are currently building on the success to develop a CAP-MIMO testbed network at 28 GHz. Fig 2: Gen 1 10GHz CAP-MIMO Protototype: RF + digital hardware; point-to-point link and initial measurements; point-to-multipoint link. Optimum performance with the lowest transceiver complexity — number of transmit/receive (T/R) modules or transceiver chains and DSP complexity. Electronic MBDM capability for channel discovery and alignment, and for creating dynamic mobile P2MP links. It is expected to deliver performance and operational capabilities that are critical to emerging cm-wave and mm-wave wireless broadband applications in future Gigabit wireless networks (5G and beyond), but beyond the reach of current systems. Technology Transfer: We are very interested in collaborating with industrial partners for further development and commercialization of CAP-MIMO technology. Industrial partners: Support from industrial partners is also gratefully acknowledged: Analog Devices, Altera, 4DSP, MI-WAVE, Microwave Dynamics, Reactel. Funding Sponsors: Funding from the Wisconsin Alumni Research Foundation (WARF) and the National Science Foundation (NSF) is gratefully acknowledged.